In April Crowdsite launched its first community contest. 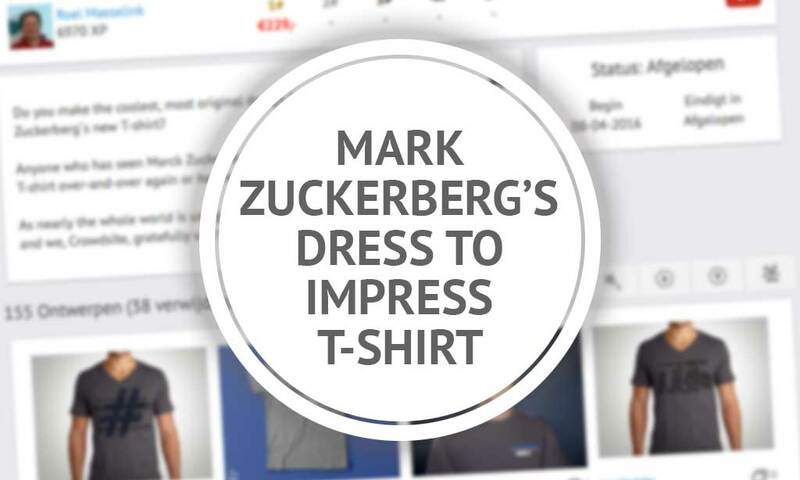 This contest, entitled ¨Design Mark Zuckerberg´s new T-shirt¨, encouraged a large number of designers. A huge amount of designs was submitted by the Crowdsite community. We are looking for a great design for Mark Zuckerberg´s T-shirt. Anyone who has seen Mark Zuckerberg lately, will wonder if Mark wears the same T-shirt over-and-over again or has he 30 of the same shirts lying in his closet. Therefore we asked our community to design the coolest, most quirky and unique T-shirt. The winning design will be printed on Mark´s 7 new T-shirts, so he has a well stocked wardrobe for one week. After the design contest was put online, designs were submitted immediately by the community. The contest, which runned until April 22nd was open to all designers, emerging designers and professionals. We received many entries and it was really difficult to select a winning design. After conducting a poll, the final selection was made. We are happy to reveal our winner, Zaini, a designer from Portugal. The winning design will be featured on the T-shirts and presented to Mark. As the entries in this first community contest were really impressive, Crowdsite plans to launch more of these contests. Click here to download all t-shirt designs.